Hasim Rahman (50-7-2, 41 KOs) wants to do it again. The man who already took on big names such as Lennox Lewis will face current WBA Champion Alexander Povetkin (24-0, 16 KOs) at the Sporthalle Hamburg, Germany, on September 29. And the American is not planning on just showing up. At the age of 39, Rahman is aiming to become the champion of the world once more. Right before the big showdown, the heavyweight took some time out of his preparations for a one-on-one interview. Hasim Rahman, you will be stepping back into the ring on September 29. Your last fight was in June 2011 which ended in a victory over Galen Brown. Now you have had quite a long break. Hasim Rahman: The Galen Brown fight was over a year ago and really was a tune up. About the only thing I can say is, that I will be in a lot better condition for the Povetkin fight than I was for Galen. What are your thoughts on your next opponent Alexander Povetkin? Where do you see his strengths and which weaknesses are you planning to exploit when you meet him inside the ring? Hasim Rahman: Povetkin is a very good fighter. He has proven to be a winner at every level. He was an Olympic gold medallist and is the current WBA Champion. I have respect for him as a boxer. Regardless of his strengths or weaknesses, I know what I have to do and that is to knock him out. I know that when I’m at my best, no one can take my power and I will knock him or anyone else out, period! As mentioned before it has been a while since your last fight. When did you start preparing for Povetkin and what shape are you currently in? Hasim Rahman: I’ve been preparing for this fight for six months. We thought we were going to fight in May, then July, now it is September 29. I haven’t been this ready for a fight in many years. I’m prepared to go twelve rounds, I’m in great condition. How are you dealing with the time difference between your hometown of Las Vegas and Germany? Hasim Rahman: It won’t have an impact on my performance. The first time I fought Lennox Lewis it was in South Africa and the time difference didn’t affect me. I will arrive in Hamburg a week before the fight, so within a day I will have adjusted to the local time. You have been in 60 fights as a professional and fought some of the biggest names such as Holyfield and Lewis. How much of an advantage might your experience be against Povetkin? Hasim Rahman: My experience is invaluable. This is not my first rodeo, I have performed on the largest stage and know how to keep my focus and how to embrace the moment. This will be your second fight in Germany. What is your take on the German boxing scene? Do you enjoy fighting over here? Hasim Rahman: I am a professional and I will fight wherever I have to. Germany has become the hot spot for heavyweight title fights. The fans are knowledgeable and really support boxing. I’m looking forward to wowing them with my performance. How will the fight end on September 29? Will it go the distance? 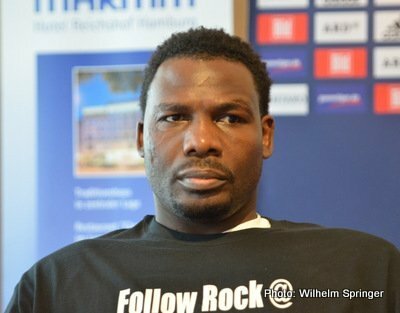 Hasim Rahman: No fight at this level is easy, but I know that I am 100 percent prepared and so I am supremely confident. The fight will not go the distance. I will KO Povetkin on September 29. Next boxing news: Has Canelo Alvarez arrived?